The JAL Project (Chairman of the Executive Committee: Mr. Sachio Kamogawa Director of the National Museum of Modern Art, Tokyo) was started in 2014 to invite overseas experts handling Japanese art materials (such as librarians and archivists) to Japan for a review on how Japanese art materials and related information should be provided. 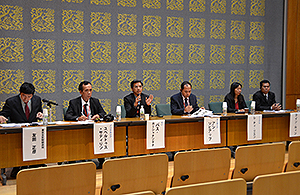 Director Emiko Yamanashi and Researcher Hideki Kikkawa of the Department of Art Research, Archives and Information Systems of the Institute were commissioned as members of that committee. Kikkawa visited Germany and Chez Republic to interview the invitees in advance, and was involved in training guidance and study tours of the related institutions in Japan. 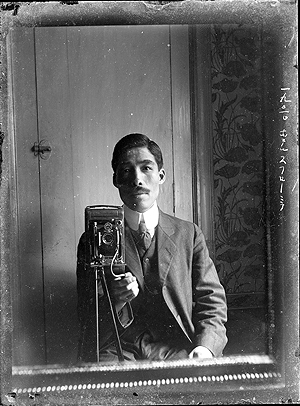 On October 3 and 5, he interviewed Ms. Cordula Treimer of the Library of the Museum of Asian Art of the Berlin State Museums, and Mr. Jana Ryndova of the National Gallery in Prague jointly with Mr. Takeshi Mizutani of the National Museum of Modern Art, Tokyo, as well as toured the locations to understand how Japanese art information was handled and released. 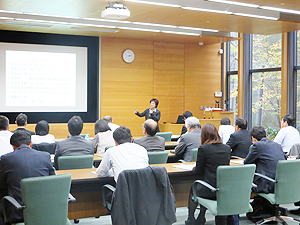 Nine overseas experts in handling materials visited Japan from November 16 through 23 to tour the related institutions located in Tokyo, Kyoto, Nara and Fukuoka. 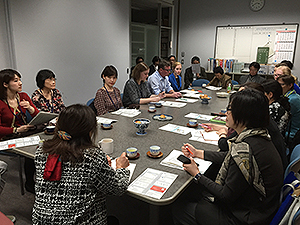 They came to this Institute on November 18 to have discussions with our researchers after the introduction of our book materials, photos of researched works, files of modern and contemporary artists, and sales catalogs, as well as relevant projects, at the library. In response to the request from the invitees in 2014, we also organized an “Exchange Meeting with Overseas Experts in Japanese Art Related Materials” for 2015 to offer them an opportunity to interact with persons working for related institutions in Japan. 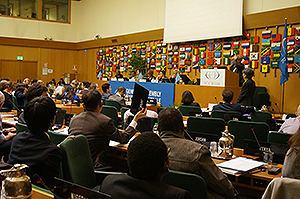 Twenty-eight participants actively exchanged professional opinions in an amicable atmosphere. On November 27, the last day of the training program, an open workshop was held at the auditorium of the National Museum of Modern Art, Tokyo. Like 2014, the invitees made proposals on the transmission of Japanese art information, which provided us with a good opportunity to reconsider how we should globally transmit information on cultural properties. Inviting experts involved in the preservation and restoration of archeological and architectural heritage from five countries in Southeast Asia, the above seminar was held at our seminar room on November 13. After the experts presented their diverse technical challenges over the preservation of historical monuments or sites s in their countries, we exchanged opinions on the possibilities of new collaboration. Indonesia and Thailand, which have many practical cases on the maintenance of monuments and sites , and Cambodia, Vietnam and Myanmar, which have been introducing new technologies particularly in recent years, presented their concrete cases. This was a good opportunity for us to get a wide overview of the current state of protecting cultural properties in historical sites and monuments, museums, and so forth. We invited Mr. Hubertus Sadirin (Advisory Expert Board on Cultural Property for the Governor of Local Government of DKI ) from Indonesia, Mr. Vasu Poshyanandana (Senior Architect of the Office of Architecture, Fine Arts Department, Ministry of Culture and Secretary-General of ICOMOS Thailand) from Thailand, Mr. An Sopheap (Head of Office of Archeology, Department of Conservation of Monuments inside Angkor Park and Archaeology Preventive, APSARA National Authority) from Cambodia, Ms. Le Thi Lien (Senior Researcher of the Institute of Archaeology of the Vietnam Academy of Social Sciences) from Vietnam, and Mr. Thein Lwin (Deputy Director General of Department of Archaeology and National Museum, Ministry of Culture) from Myanmar. At the comprehensive discussion, active dialogue was undertaken over how to preserve unearthed remnants of ancient buildings, consistency between new and old materials used for restoration, quake-resistant measures for structures, balance between tangible and intangible values in conservation, issues on management systems and HR, etc. These tropical or semitropical countries have many similarities not only in their climatic environments, but also in challenges on factors of and countermeasures to material deterioration. 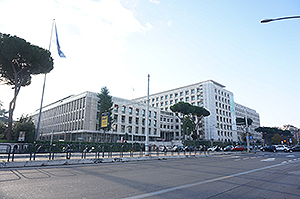 This meeting worked as a good opportunity for them to reconfirm the continual information sharing and cooperation toward the further collaboration within and outside the region. Communicating with these countries closely, we would like to clarify their support needs and consider more effective approaches for cooperation. From November 4 to 20, 2015, the International Course on Conservation of Paper in Latin America was conducted as part of the LATAM program of the International Centre for the Study of the Preservation and Restoration of Cultural Property (ICCROM). The course was jointly organized by NRICPT, ICCROM, and Mexico’s Coordinación Nacional de Conservación del Patrimonio Cultural, Instituto Nacional de Antropología e Historia (CNCPC-INAH). It was held at CNCPC-INAH and this year was the fourth time. There were 9 participants who are experts of conservation for cultural properties and hailed from 8 countries of Portugal, Belize, Chile, Columbia, Cuba, Mexico, Uruguay and Venezuela. The first half of the course was conducted by NRICPT. 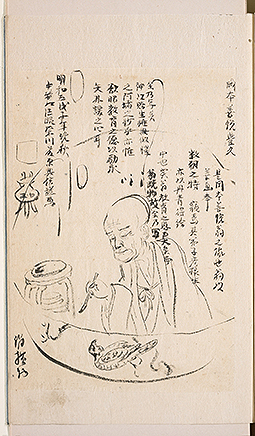 It was aimed to apply the paper conservation techniques of Japan to cultural properties overseas. Providing the lectures on the protection on cultural properties in Japan as well as the materials such as Japanese paper and adhesive, basic knowledge of the traditional mounting and restoration techniques, the practical session was implemented. The practical session was supported by the staff member of CNCPC-INAH, who had learned the traditional mounting and restoration techniques at NPICPT for several months as part of the program. 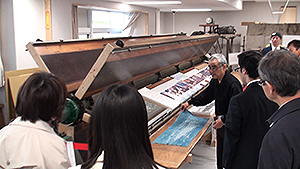 Following the demonstration by the Japanese instructor, the participants experienced the basic of the traditional mounting and restoration techniques, such as cooking paste, cleaning, infill, lining and drying with karibari. 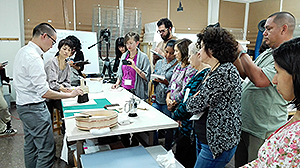 In the last half of the course, the experts of conservation of cultural properties in Mexico, Spain and Argentina conducted lectures on the application of Japanese paper to the conservation in the west and so forth. 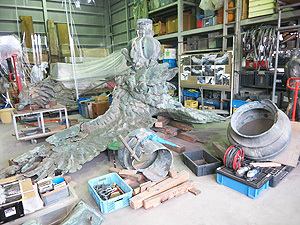 Through such technical exchange, the plans are to conduct similar training sessions in the future as well in order to deepen understanding of the conservation techniques of Japan and contribute to protection of the cultural properties overseas.